"A detail of carved steps shows 1,300-year-old Maya text that provides only the second known reference to the so-called “end date” of the Maya calendar. "Image Source: David Stuart/Tulane University via Archaeology News Network. Two days ago, archaeologists announced a new discovery in Guatemala: a second Mayan tablet which predicts the doomsday date of 21 December 2012. 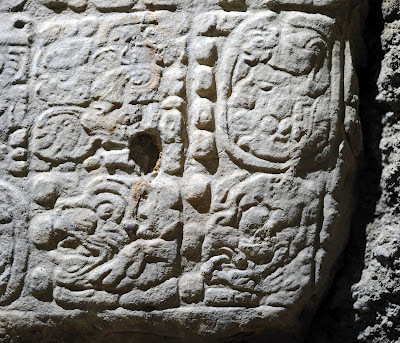 Archaeologists working at the site of La Corona in Guatemala have discovered a 1,300-year-old-year Maya text that provides only the second known reference to the so-called “end date” of the Maya calendar, December 21, 2012. The discovery, one of the most significant hieroglyphic finds in decades, was announced today [28 June 2012] at the National Palace in Guatemala. “This text talks about ancient political history rather than prophecy,” says Marcello A. Canuto, director of Tulane’s Middle American Research Institute and co-director of the excavations at La Corona. Since 2008, Canuto and Tomas Barrientos of the Universidad del Valle de Guatemala have directed excavations at La Corona, a site previously ravaged by looters. ... What Canuto and Barrientos found was the longest text ever discovered in Guatemala. Carved on staircase steps, it records 200 years of La Corona history, states David Stuart, director of the Mesoamerica Center at The University of Texas at Austin, who was part of a 1997 expedition that first explored the site. While deciphering these new finds in May, Stuart recognized the 2012 reference on a stairway block bearing 56 delicately carved hieroglyphs. It commemorated a royal visit to La Corona in AD 696 by the most powerful Maya ruler of that time, Yuknoom Yich’aak K’ahk’ of Calakmul, only a few months after his defeat by long-standing rival Tikal in AD 695. Thought by scholars to have been killed in this battle, this ruler was visiting allies and allaying their fears after his defeat. “This was a time of great political turmoil in the Maya region and this king felt compelled to allude to a larger cycle of time that happens to end in 2012,” says Stuart. So, rather than prophesy, the 2012 reference places this king’s troubled reign and accomplishments into a larger cosmological framework. “In times of crisis, the ancient Maya used their calendar to promote continuity and stability rather than predict apocalypse,” says Canuto. See other reports about this exciting find here and here.